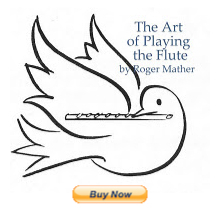 and he includes the most interesting graphs and charts of measurements taken from professional flutists. But what's most interesting is that not much new knowledge seems to have come to light SINCE 1974 when the above article was written. That may mean that the assumptions and suppositions given may still be somewhat correct, despite constant waggling of opinion on the flute email lists. So do help yourselves to the the key points and see where they fit into our common flutey knowledge.